Montesquieu. Painting of 1728. It is now in a museum in Versailles. 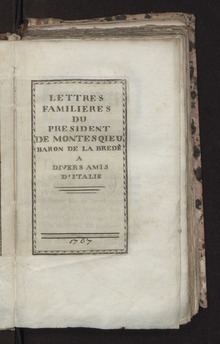 Charles-Louis de Secondat, Baron de La Brède et de Montesquieu (18 January 1689 – 10 February 1755), was commonly known as Montesquieu. He was a French political thinker who lived during the Age Of Enlightenment. He is famous for his theory of the separation of powers in government. Many constitutions all over the world use it. He helped make the terms "feudalism" and "Byzantine Empire" popular. These should be balanced, so that no one power would be able to overcome the other two, either singly or in combination. This was a radical idea because it eliminated the three estates structure. Montesquieu's ideas are important because they ended the feudalistic structure. They also helped inspire the constitution of many countries, including the United States. Some of Montesquieu's ideas are still controversial. He believed that women could be leaders in government. But he thought women could not lead a family. He supported a hereditary aristocracy and primogeniture. Hereditary means that the title passes from the parents to the children. Montesquieu's philosophy that "government should be set up so that no man need be afraid of another" prompted the creators of the Constitution to divide the U.S. government into three separate branches. Montesquieu in The Catholic Encyclopedia. Montesquieu in The Stanford Encyclopedia of Philosophy. This page was last changed on 28 March 2019, at 17:38.